As a '90s kid, I'm more than pleased by the recent nostalgia kick inspiring the world to basically bring back the entire decade piece by piece. And I'm super excited to say that now includes the return of Crystal Pepsi — sort of. In a fun new commercial that throws it back to 1992, Pepsi announced they are reviving the clear soda as part as part of a Pepsi Pass promotion. Yes, please! Although some people never understood the clear cola craze, I'm all in. You get the taste of regular soda without the potential staining it can mean for your smile. These are things I think about because (a) I'm a nerd and (b) caffeine gives me life. And even if I had been on the fence about the transparent beverage, I would easily have been swayed by the brilliant commercial dripping with '90s nostalgia that Pepsi created to herald Crystal Pepsi's comeback. In the video, a janitor finds a secret button to floor "92." As he exits onto that floor, the video seemingly switches to VHS-quality ... and as the sounds of "Whoomp! There It Is" stream out of an office party, we're all transported right along with the janitor to the glory days of the early '90s. So what exactly does the '90s-centric new commercial (even dial-up got a cameo) mean for die-hard fans? Could Crystal Pepsi be making its way back to the market in an official capacity? Let's not get ahead of ourselves — there's a catch. As of right now, the only way to get your hands on some of that crystal clear goodness is to sign up for a sweepstakes via Pepsi's brand loyalty program, Pepsi Pass. Of the people who do so, the brand will then select 13,000 winners to receive a complimentary six-pack. 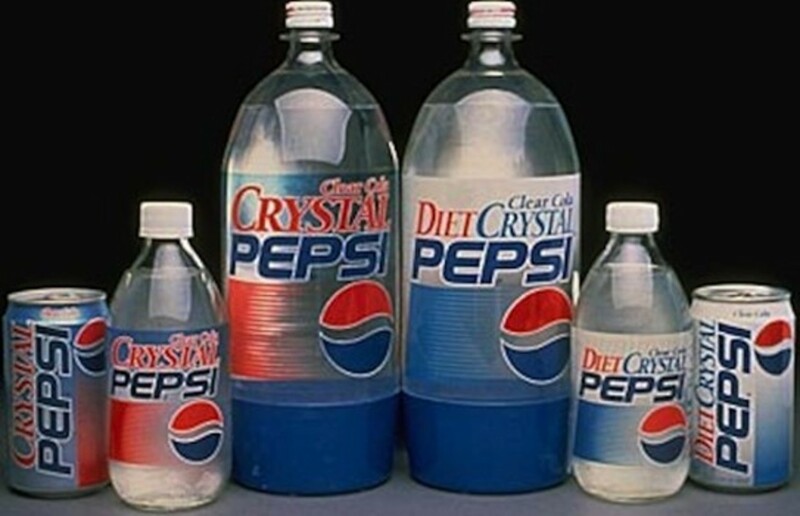 Although the demand for Crystal Pepsi has been relatively unwavering over the years, the transparent cola was actually short-lived during its original run. Following a hyped-up launch campaign in '92, the initial fervor over the soda soon fizzled; Crystal Pepsi was pulled from the shelves entirely only a year later. Still, nostalgia enthusiasts refuse to let their beloved clear soda go gentle into that good night. In addition to lobbying the brand for its return, fans have managed to keep it circulating in random bursts on sites like eBay — where the clear pop can run up to $100 a, well, pop. Whether or not you should actually try drinking 20-plus-year-old soda, however, remains to be seen. Besides, why chug decades old Crystal Pepsi when you can swig a new batch of the see-through stuff? Don't miss your window to enter into the sweepstakes, which only runs from noon ET on Dec. 10 until midnight on Dec. 11. PS: Did I mention you also must have 1,000 existing points on your Pepsi Pass? If you need to make a mad dash to get these, you can score 'em by plugging in promotional codes from products and "hanging out with friends who also have Pepsi Pass, referring friends, or by visiting Pepsi Pass locations," says the brand's site. If you do happen to be one of the chosen ones, you're in store for a sweet, '90s-style Christmas — winners will receive their Crystal Pepsi six-packs on Dec. 24. Booyah! UPDATE: If you've been wondering whether this promo heralds a more permanent return for the drink, unfortunately we just don't know; said a Pepsi spokesperson to Bustle via email, "At this time we can't confirm any future plans for Crystal Pepsi." I'll keep my ear to the ground for you all, though!